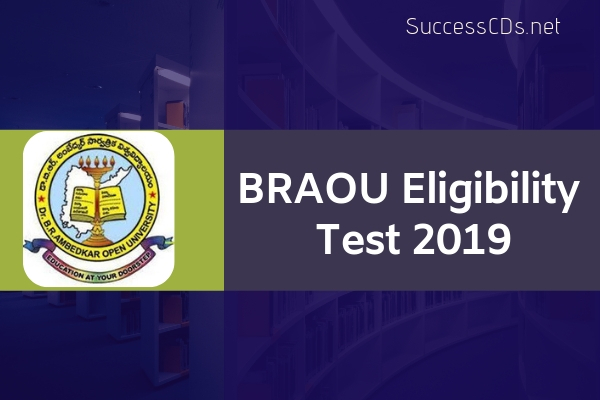 BRAOU Eligibility Test 2019 - Dr. B.R. Ambedkar Open University (BRAOU) had issued the notification for Eligibility Test 2019 for admission into B.A. /B.Com/ B.Sc. Under Graduate Programs for the academic year 2019-20. Candidates who wish to appear for Eligibility Test to get admission in B.A./B.Com. /B.Sc. undergraduate program have to register through online from university website www.braouonline.in. Candidates who have not passed Intermediate (or) its Equivalent Examination are eligible to appear for the Eligibility Test for seeking admission into 1st year of the B.A./B.Com/B.Sc UG Foundation Course (3 Year Degree Program) for the Academic Year 2019-20, provided they have completed 18 years of age by 01st July 2019. Note: Candidates who do not complete 18 years by 01st July 2019 are not eligible to appear for the Eligibility Test. Test will be conducted in English, Telugu & Urdu Medium at the Study Centres of Dr. B.R. Ambedkar Open University. Candidates who wish to appear for Eligibility Test shall register through "Online" from our own website i.e., www.braouonline.in. After receiving the SMS from concerned study center, then only the candidate has to Pay Rs.300/- (Rupees Three Hundred Only) by debit/Credit Card through University online OR Rs.310/- (Rupees Three Hundred Ten Only) at the TS/AP online Franchisee Centre towards Registration Fee and obtain receipt. Candidates have to pay the application fee through online mode only after filling the required details. There are certain gateways for the candidates to make the payment such a Debit/Credit Card and at the TS/AP online Franchisee Centre towards Registration Fee and obtain the receipt.